Simple enough and step-by-step tutorial about protecting your blog. The thing you have to do at first is to backup you database. You can backup it manually in phpMyAdmin by going to the Export tab. Another way – is to use WordPress plugin, which allows you to create database backups. There are plenty of such plugins but today I recommend you to use DBC Backup 2. After you have created your database backup you can backup your theme files and uploads folder. Do it anyway you want (SFTP for example). WordPress core files and plugins do not need to be backuped, unless their files wasn’t changed, because you can always download the latest clean version of WordPress and install the plugins (without malicious code, which could spread through your website files before). To setup chmod rights you can use your SFTP client. The .htpasswd file should contain usernames and passwords, each pair on the next line. You can create your encoded passwords on this page. Changing default error messages on failed log-ins. 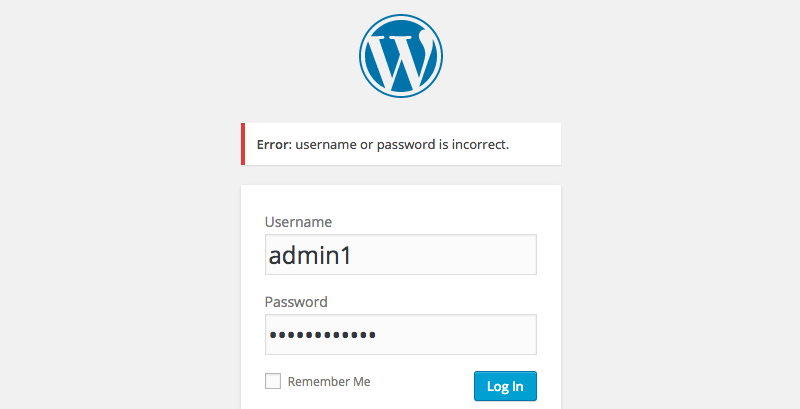 When you fails, WordPress will show you, what was wrong – login or password by default. This can be useful for hackers to start a brute force attack. So, they can get your password if they know your login. There is an easy hook which allows you to split this two error messages in one, e.g. “Error: Username or password is incorrect.” Put this code into your functions.php file. Everybody knows the WordPress default admin username. The hackers knows it too, of course. So, this function allows you to change login of any user anytime you want. Insert this function into you website and then jusn run it once. Yes, this is a username. And when you’ve logged in as admin and have posted a comment, hackers can easily gets your login. How to prevent this? The first way is not using admin account for commenting the blog. The second and the best way is simply to change or hide admin username from comment class attribute by inserting the following code into your theme functions.php file. There is great plugin, Login LockDown. It disables login function for a certain IP range, if more than a given number of attemps are detected from this range within a short period of time. I mean wp-config.php. This file contains database username and password, so, it must be protected as well. How to do it? Just move your website wp-config.php into the directory above your website folder. You can also protect it with .htaccess rules, put this code in .htaccess file which is situated in the same directory with wp-config.php. If someone has an access to your website dashboard as an administrator, he probably also can edit website theme and plugin files. To prevent this ability from anyone, you should add the following line into wp-config.php file. After you have done that, the editor will disappears at all. Also it would not be available by the URL. If you have not installed your blog yet, you can setup database prefix within the installation process. If you have already installed WordPress blog – follow this instructions. So, the hotlinking is when someone steal your website content (usually images) and insert direct links to them on their own websites. The problem is that they steal not only images but also your bandwidth. And how we can prevent this? Pretty simple! There would be another code for your .htaccess. You can use .htaccess situated in your website root directory but also the one in the directory with images. # DO NOT FORGET TO SPECIFY YOUR OWN DOMAIN! This code denies access to any file in a directory except files with given extensions. So, it also disables PHP files execution in this directory (and also in all its child directories). I recommend you to protect /wp-includes/ directory as well. First file you should remove is readme.html, located in you blog root folder. This file contains the WordPress version you use. Remember that hackers can find proper exploit for the exact version of WordPress. Another file is install.php located in /wp-admin/ directory. This is installation script and also should be removed. Removed files will appear again after every WordPress update. This post is very clear. In such a sensitive topic. This was very good. You have a deep knowledge of WordPress. Impressive.